Photo provided by Ian Cade. 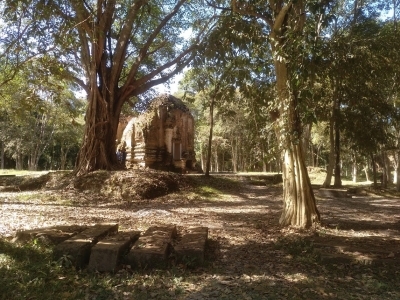 The Temple Zone of Sambor Prei Kuk is an archaeological site of the Pre-Angkorean period. The site correspondends with Ishanapura, the capital city of the Chenla Empire that flourished in the late 6th and early 7th centuries CE. A particular feature are its octagonal shaped temples, the oldest of its kind in South-East Asia. Ignoring Els’ rule to "always do Angkor last on any trip involving Angkor" I opted for one last WHS visit on my way to the airport in Phnom Penh: Sambor Prei Kuk. The site is conveniently located close to the main road between Siem Reap and Phnom Penh. So this was simple stop over, splitting a long bus ride into two more manageable legs. 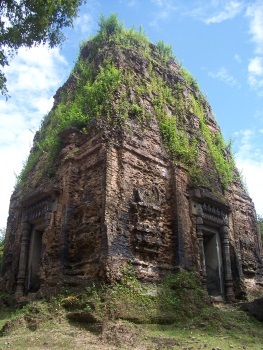 Sambor Prei Kuk was the first capital of the Khmer Empire and predates Angkor by 300 years. Initially I was worried to get a worse version of Angkor. But the age difference clearly shows in artistry and architecture and sets the site apart. It does have the same jungle setting with trees growing in and on top of buildings. But due to the way smaller crowds (if any) Sambor Prei Kuk is a more intimate experience. So in summary, the site felt like a nice last visit complementing my Angkor experience. So I would argue that Els original rule needs a revision. The next big town is Kampong Thom. Most buses running between Siem Reap and Phnom Penh will stop here. You can buy tickets at your local hotel or a travel agency. Via minibus it took 2.5h including pickup at my hotel to get from Siem Reap to Kampong Thom. Travelling on via normal bus to Phnom Phen the journey took 4.5h, 30min spent on a break and at least 1h spent in the terrible traffic of Phnom Penh. I would opt for a minibus if you have the choice. From Kampong Thom you can take a car (20 USD) or a Tuk Tuk (15 USD) to the site. I opted for the Tuk Tuk and we drove for an hour to get there. The ride was organized by my hotel, but there are plenty of Tuk Tuk drivers roaming the main street in Kampong Thom. Alternatively, you can contact the local tourism board. Finally, Thomas stated that there was also a public bus available, but Tuk Tuk will always be my preferred option if available. You can do Sambor Prei Kuk easily as a day trip from Siem Reap using public transport. Doing the same from Phnom Penh is probably harder due to traffic. Kampong Thom itself is uneventful. It boasts some rather simple hotels and restaurants. Main nearby attraction would be Tonle Sap Lake, the largest fresh water lake of South Eastern Asia. The lake is unique as the flow to the Mekong reverses during high tides. It is already a Unesco Biosphere Reserve, but maybe it also has potential for a world heritage site. From Phnom Penh, it is possible to do a day trip to Sambor Prei Kuk, a beautiful pre-Angkorian temple complex in the middle of the forest. The Kampong Thom local tourism office actively encourages tourists to arrange visits with local communities - from tuk-tuk rides, tour guide service and site interpretation. This is the best preserved pre-Angkorian archaeological site in Cambodia and if all goes to plan then this should be Cambodia's next World Heritage Site. The ruins here comprise three different temple complexes all within easy walking distance of each other. They are set among a nice sandy forest that gives the site a cool and relaxing atmosphere. The ruins are different enough from those at Angkor to warrant a visit and also provide a good look at pre-Angkorian styles or art and architecture. The temples are mostly brick built and look more like hollow pyramids, the distinctive poses of the statues of this period are shown in reproductions as the originals are now in museums. There is also a fair bit of bomb damage to some of the temples, from the US bombing raids and also from the civil war. 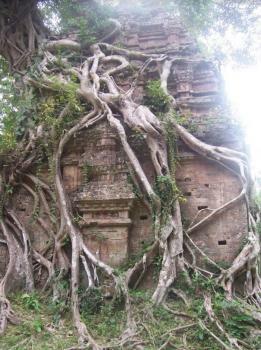 There are also several temples that have been completely taken over by trees, the gatehouse at the final complex is now more tree than brick. The site is located to the north of Kompong Thom. I managed to visit in a short day trip from Siem Reap. It was very easy to get a moto from the junction just before Kompong Thom out to the site and to bring me back. The route out there was very enjoyable, going through some nice villages and between some lovely paddy fields. 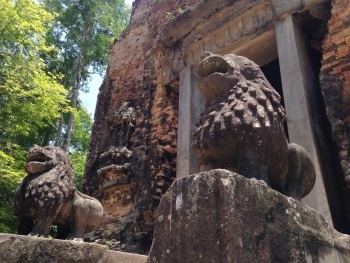 The temples here were sufficiently different from those at Angkor to warrant a visit. There is a nice ambiance to the site and it is a good way of seeing something more of Cambodia's earlier heritage.